Shopmusclefit.com is an online pharmacy that was set up 2008 which specializes in the sale of steroids. 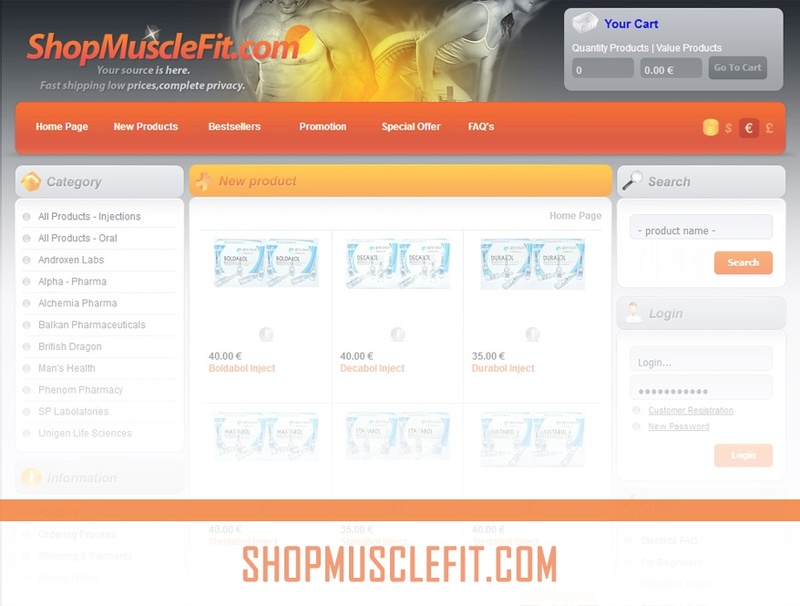 It is claimed that shopmuscleclefit.com is managed by professionals and deals with the sale of brand and generic products. All the drugs are sourced from reputable manufacturers though there is no proof that they have been approved by the FDA. There is no proof of verification from any of the regulatory bodies on their website. The medications stocked are classified into various categories which include All Products- Injections, All Products-Oral, Androxen Labs, Alpha-Pharma, Alchemia Pharma, Balkan Pharmaceuticals, British Dragon, Man’s Health, Phenom Pharmacy, SP Laboratories, and Unigen Life Sciences. No prescription will be required to purchase any of the products in these categories. I went through the Man’s Health Category to know the medications that are stocked and noted that they are both brand and generic drugs. These include the Brand Cialis which costs $9.41 per pill, Kamagra from Ajanta Pharma, Levitra from Bayer AG, Sildenafil Citrate, Tadalafil, Vardenafil, and the Brand Viagra from Pfizer which will cost $14.12 per pill. Some of the new products have been featured on the homepage to create awareness to the customers logging into the website which include Boldabol Inject, Decabol Inject, Durabolt Inject, Mastgabol Inject, Stanabol Inject, and Sustabol Inject. The accepted means of paying for the medications purchased at shopmusclefit.com is payment transfer. It is indicated that when sending the money, you should indicate that you are sending the money to a friend or a family member since the transfer of money for commercial purposes is not allowed. Very risky! It is unfortunate that the use of credit cards will not be accepted in paying for the drugs. The other means of payment include Bitcoin, Moneygram, PaySafeCard, US Money Express, and Western Union. Shipping of the drugs purchased from shopmusclefit.com will be shipped via the priority airmail shipping method and will take a maximum of 21 days to have the medications delivered. The cost for the registered mail is $11.76. There are other methods that can be used for the shipping depending on the destination which includes DHL, EMS, Express Mail, FedEx, GLS Logistics, and UPS. If the order is lost during the shipping shopmusclefit.com advises their customers to notify them if their orders are not delivered within the agreed time. The orders will be re-shipped except for the orders that will be delivered to Australia, Canada, Singapore, South Korea, and New Zealand. To contact shopmusclefit.com, the only option is using the contact form that has been provided on their website. You will be required to provide a phone number and an email address through which you will be reached when the response will be given. The available reviews from the customers who have been buying medications from shopmusclefit.com are negative. This is a thread where the participants are complaining of receiving fake products from shopmusclefit.com. They also claim to have noted some of the products that were discontinued years ago still displayed on the website. Kamil89 says that he tried contacting shopmusclefit.com a number of times but there was no response. Nitromanne says that the idea of selling products that people already know are fake is not a good idea. 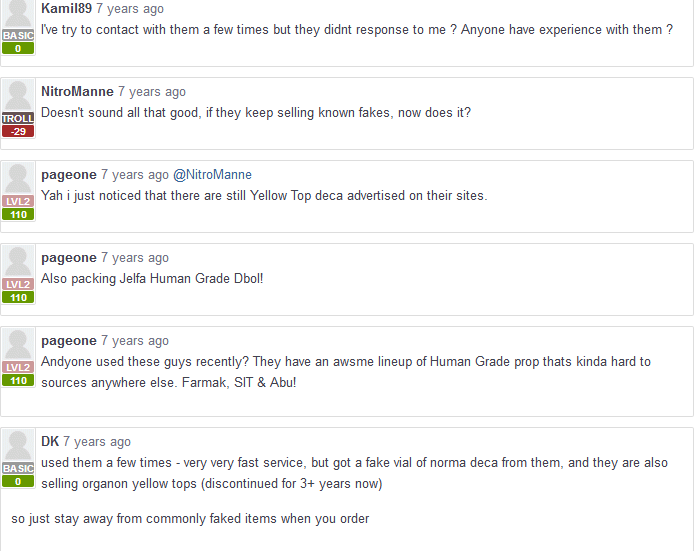 Another person by the name PageOne says that he has noted that a product by the name Yellow Top Deca that was discontinued is still advertised on their website. Another client gets into the conversation and adds that he has also noted another product called Jelfa Human Grade Dbol is still is stock despite having its production discontinued. DK had purchased from shopmusclefit.com for a number of times and the services were very fast. He says that at one time, a fake vial of Norma Deca was sent to him and noted Organon Yellow Tops in stock despite having been discontinued three years ago. These reviews show that the products that are in stock are not of the best quality despite claiming that they are sourced from reputable manufacturers. It is also clear that there is a breakdown of communication between shopmuscle.com and their customers. I searched for current reviews from the customers who have been shopping from shopmusclefit.com but none were available. The last reviews were posted over 7 years ago and were negative and the lack of reviews means that there is no way we can know if things are different today. Shopmusclefit.com has several discounts on selected items on their website. It is not clear if this is a permanent offer or a seasonal offer and the prices will be back to normal. 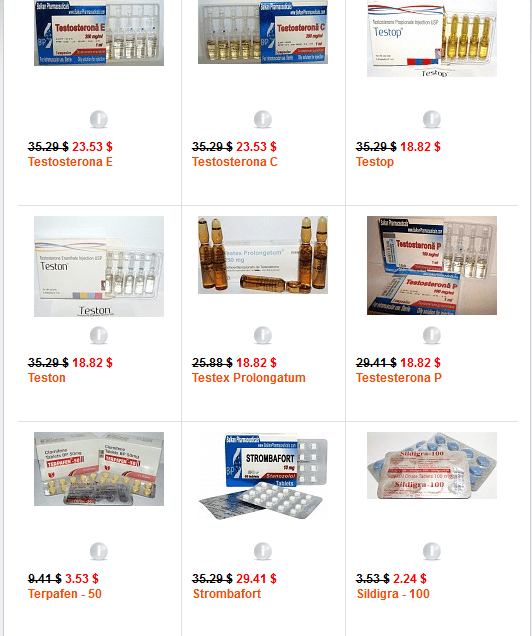 Testosterona E was selling at $35.29 but is now selling at $23.53. Testosterona C was selling at $35.29 but is now selling at $23.53. Testop was selling at $35.29 but is currently selling at $18.82. Teston was selling at $39.29 but is now selling at $18.82. The other products that are on sale include Testex Prolongatum, Testesterona P, Terpafen- 50, Strombafort, Sildigra, Oxandrolon, Methandienone, and Equipoise (Boldenona- E). Unlike other online pharmacies that will provide free shipping for huge orders, shopmusclefit.com charges a shipping fee on all orders. It is also not clear if the prices of larger packs will be less since there is no price list showing the prices of different packages. Shopmusclefit.com is an online pharmacy that has a lot of negative feedback from the customers who have been buying from them. Most of the clients complain about getting fake products and a lack of proper communication whenever a clarification is required. Though it is claimed that the products have been approved by the FDA, it is unclear if this is true as some of the customers claims that some of the products were discontinued a couple of years ago are still being advertised on the website. Customers will not be required to provide a prescription to purchase steroids though it is unclear if taking the risk of buying from them will ensure that the drugs are delivered and whether the drugs will work as they should.